Journalist, wife, mother, homemaker, and now a film producer, Supriya Menon says she was not at all prepared when one fine day her actor-husband asked her out of the blue about jointly running their production company, Prithviraj Productions. “I had my apprehensions initially. I said yes thinking it would be an easy and glamorous job. But now I realise how tough it is,” she laughs. Their inaugural venture, 9, comes out in theatres tomorrow. Why did you both pick 9 as your first project? It has to do with the merit of the script, which came to Prithviraj first as an acting vehicle. He told me he’d heard an unusual script which he wanted to be part of. At that point, we had no plans of producing it, but later on, we began actively thinking of launching our own production company with 9 as our first project. I was also feeling the need to do something as getting back to journalism wasn’t working out as an option for me. So I thought of being part of the world that he is part of, and see if I could do something there. We then had conversations with Sony Pictures International and 9 happened. Were you on the same page about starting with a big project? Well, I wouldn’t really call 9 a big-budget film. In terms of spectacle and scale, yes, it’s big, but I don’t think ‘budget’ is the right way to classify it because that really shouldn’t be the criteria to judge films. At least that shouldn’t be how you get into a project. Yes, the economics matter, but ultimately filmmaking is not just about the business. The first and foremost thing is a relatable, touching story which works for the audience and, hopefully, at the box office. As a producer, I’m proud to say that my line producer, Harris Desom, and I managed to finish everything on time and under budget. Did you guys have a target audience in mind? Was there a discussion about making a film that clicks not just with the A centres, but also B and C? It’s not possible to cater to all sections of the audience sometimes. Do I want everyone to watch it? Definitely. As a producer, you want your film to reach the maximum number of people. 9 is at its heart the story of a father and son. So, at the end of the day, we can’t really say that this film is only meant for the multiplex crowd. I think everyone will have something to take away from it. Promoting a film isn’t easy these days given that audiences no longer fall for lofty claims. How are you promoting 9? 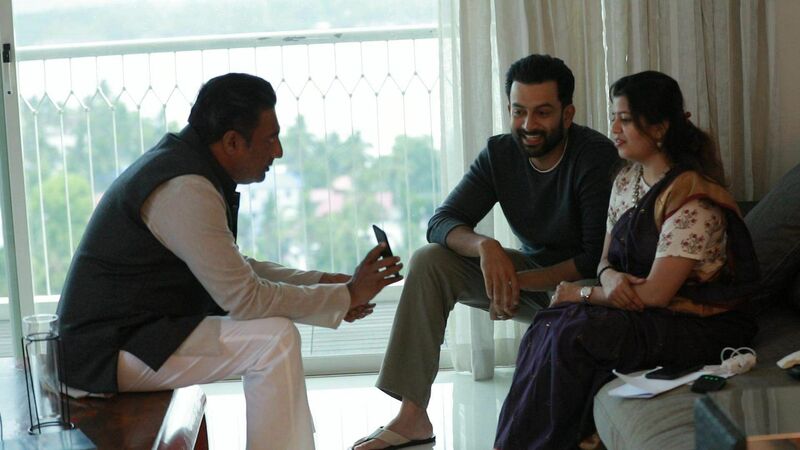 Prithviraj has talked in some interviews about taking Malayalam cinema to the world. Some critics have opined that making Hollywood-ised films is not the right way to do it — that the more local the stories, the more international they become. What’s your take on this? Look, everyone has their way of thinking. Prithviraj has been saying this for the longest time, right from the time we started dating, back in 2007. If this is his way of taking Malayalam cinema to a global audience, then let’s see where that will take him. Prithvi is someone who likes to walk the talk, and I don’t say that just because he is my husband. If he fails, then he might figure out another way. How are the tasks split between the two of you when it comes to running the production house? We have very clear boundaries. I handle the administration and finances, whereas he takes the creative decisions. That way we are not stepping on each other’s toes. For 9, anything to do with the filmmaking was handled by Jenuse, Prithvi, and Abhinandan Ramanujam (cinematographer). Since we had to shot in locations like Manali, there were naturally some logistical and financial challenges. Whenever we encountered a roadblock we couldn’t handle, we approached Prithvi. I heard you are a strict disciplinarian on set. Well, I like disciplined sets, and Prithvi does too. I have my blinders on when I’m working. Also, it has to do with the fact that I used to be a journalist. When you have a deadline to keep, you don’t get time to eat or drink. I’m used to working 17 or 18 hours. When I was covering the Mumbai floods, I didn’t have time to go home and had to sleep in my office. You had to go and do the reporting no matter how inconvenient it was. Moreover, you have to start planning for the upcoming week’s stories in advance. All that has helped me tremendously. I think it would be cool to have more female bosses around. This is Jenuse’s second film. Suppose a first-time director comes to you with an idea like 9, would you do it? Encouraging fresh talents is certainly one of our company’s objectives. And Prithvi has worked in the films of so many debutants — from RS Vimal’s Ennu Ninte Moideen to Nadirshah’s Amar Akbar Antony to Nirmal Sahadev’s Ranam, among others. If we are convinced that someone is capable of executing a particular script for a particular budget, then we’ll definitely go for it. It’s not just about encouraging talents that subscribe to our vision, but also those with a different vision, as long as it’s something worth pulling off. We have only started our company, and right now, the primary aim is to get 9 released.